Every great adventure needs a great villain. I am going to start giving the villains of the Companions of the Silver Apple campaign room to shine....or better said room to darken? 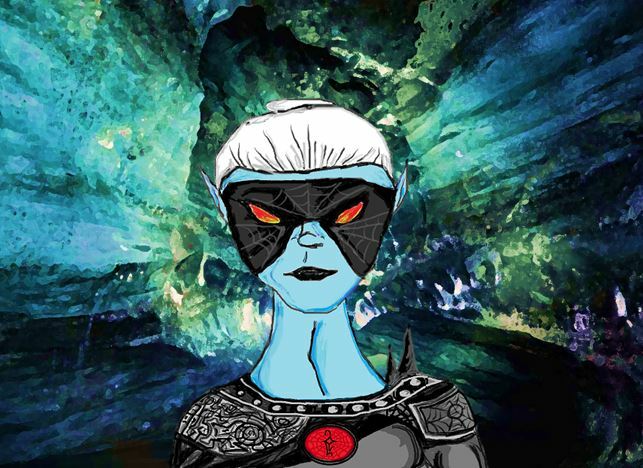 Toylab is currently working on the Drow project in which a slew of villainious Drow characters are going to be made. Among them is insidious stalker In Nhil. 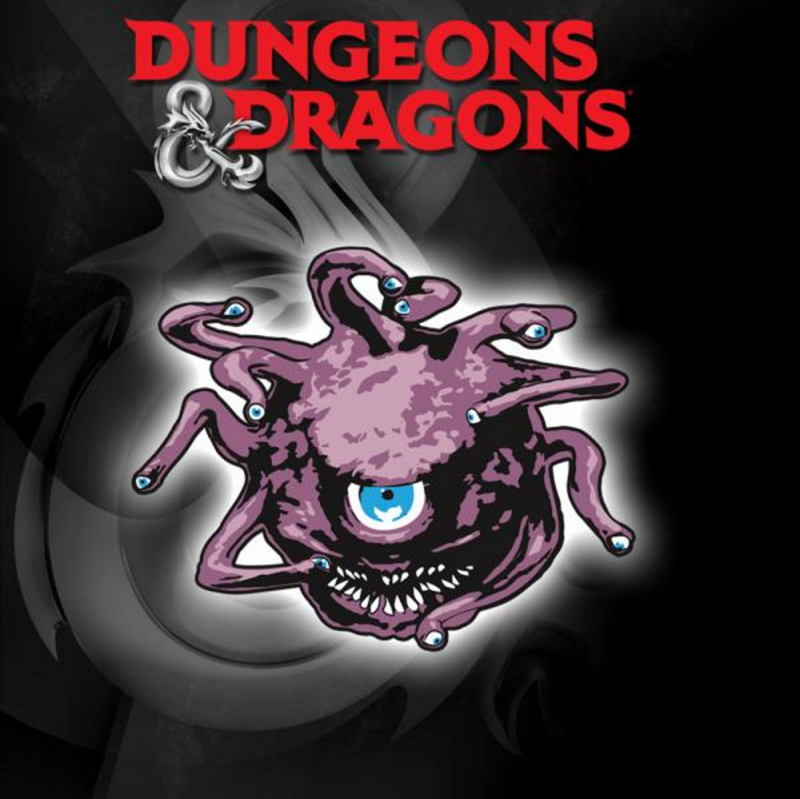 The Companions of the Silver Apple have now met one of the dastardly characters behind the current machinations they are trapped in, the cold hearted In Nhil. In Nhil is a female Drow Elf which normally means that she would be a high ranking member of her house and above doing dirty work for anyone. In Nhil is not your typical female House Noble however and enjoys employing her skills in the streets. At a young age In Nhil was cast out from her own house after a crime was commited by her father. She was given the name Ran Kren a name designed to be demeaning for both its meaning, "Lesser Fool" (Ran = Lesser, Kren = Fool), but also because it was in the masculine form. The older siblings of her house would periodically attack and beat her. Finally, after years of abuse Ran Kren began to retalliate and lashed out baddly beating one of her older siblings. The Matriarch admired Ran Kren for getting stronger but also saw her as a problem and caste her out into the wild, and deadly streets of the underground city of Menzoberranzan. While most adults do not survive the streets of Menzoberranzan when being houseless, the young Ran Kren found a way. Finding a livelyhood by stealing, spying, and eventually assassinating she managed to gain attention of a young noble Erel Zilv. Erel Zilv was one of the females of the forgotten House of Freth. A Drow house that had nearly been in entirely destroyed save for a few remaining noble children. Erel and her siblings were raised by the most powerful house in Menzoberranzan, House Baerne. While House Baerne treated the siblings relatively well, they were still seen as 2nd class citizens and the highests honors and positions always went to true blood members of House Baerne. Erel Zilv plotted along with her brothers to return their house to glory and get out of the confines of House Baerne. Increasingly, looking for sources of power in untapped dark regions Erel found she needed a more street wise resource. Erel hired and eventually befriended the street urchin Ran Kren. Seeing worth in the skilled young woman Erel fought to get her into the academy of fighters. There Ran Kren was still teased for her name but this time was shown some respect and even backed up by the children of House Freth and even House Baerne. She became accomplished in the fighting school and upon graduation she was officially inducted into the reborn House of Freth. When inducted her old name was expunged and she was given a new name by Erel herself. In Nhil the "Hidden Fear". In Nhil has grown to become the most trusted right hand of House of Freth. Using her knowledge and contacts from the streets and her fighting skills she has lived up to her new name and spread fear from the shadows. While the reformed House of Freth is still small it has come to be grudgingly respected by even the higher houses in no short reason for In Nhil. In Nhil has undergone a new mission to help with Erel's ultimate design to raise the House Freth beyond all others. She just needs to locate a pesky Flute and eliminate who ever is currently holding it. Want to start your own Drow project? Amazon can help you get started with these awesome miniatures. For Stats of In Nhil I have decided to use the homebrewed stats of a Drow Assassin created by Raven Von Bloodmire. 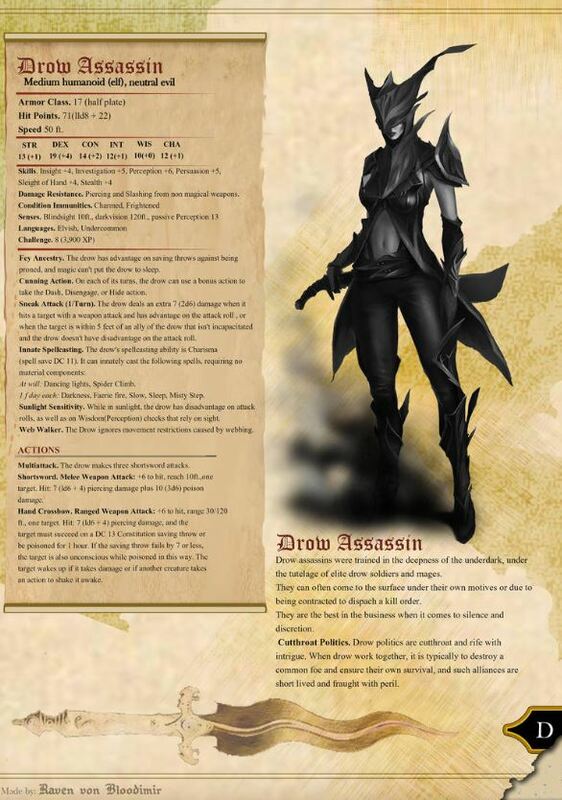 I had my own stats and powers when she first appeared stalking the party in the sewers of Luskan however, I think I will move my stats closer to this Drow Assassin. Looking for Drow Lore resources I found KismetRose where there is both a lot of information on Drow and also a Drow name generator. Pictures of the Drow Project and the progress on the In Nhil Mini can be seen on the Compaions of the Silver Apple Instagram. Check it out!